A Bresser Messier AR102xs 102mm, f/4.5 achromatic refractor was mounted on a Celestron AVX mount and a QHY 5L-ll-M fitted with a ND13 filter was placed at the Prime focus. 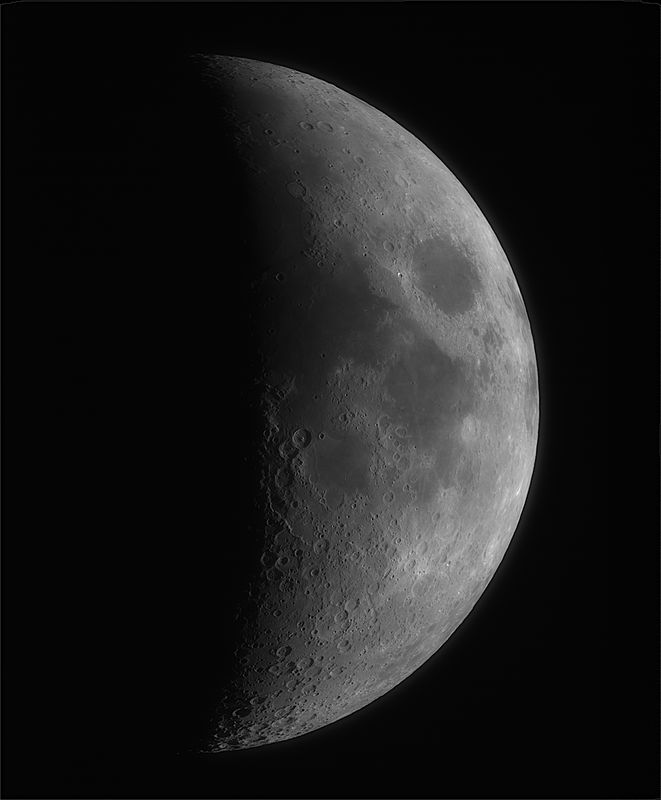 A 5000 frame SER file was captured of the 40% waxing Moon. Autostakkert! 3 running in Wine was used to stack the best 20% of the frames and Registax 5.1 also running in Wine was used to wavelet process the image. The final image was processed in the Gimp 2.10. A Skywatcher 130 PDS 130mm, f/5 Newtonian, was mounted on a Celestron AVX GOTO mount and an Atik 314L camera was placed at the Newtonian focus. 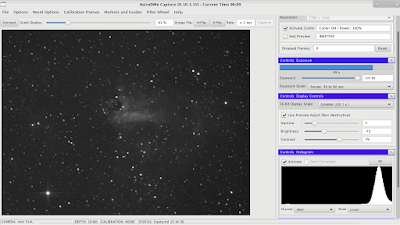 AstroDMx Capture for Linux was used to capture 30 x 60s exposures of the Swan or Omega nebula. The data were dark-frame and flat-field corrected and stacked in Deep Sky Stacker running in Wine. The resulting Fits file was processed in the NASA, ESO, ESA Fits Liberator software and Fitswork running in Wine and post processing was completed in the Gimp 2.10. This image was captured as part of our experiments to refine the display of the 16 bit images, non-destructively, on an 8 bit monitor during capture.